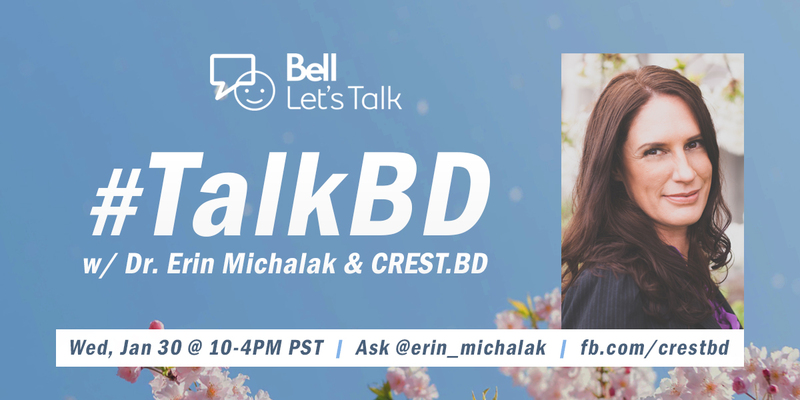 In alliance with Bell Let’s Talk Day 2019 on January 30, Network Lead Dr. Erin Michalak and members of the CREST.BD team took questions on all things BD on the CREST.BD Facebook page and Twitter using the hashtag #TalkBD. The six-hour online conversation touched on a series of different topics, and featured contributions from our partners at the International Bipolar Foundation and UBC Psychology. Broadly speaking, there are a range of organizations dedicated to supporting people with mental health challenges at school or university. The relationship between education and BD is fully explored on our Bipolar Wellness Centre (bdwellness.com/Quality-of-Life-Areas/Study) and we list a number of well-regarded tools and organizations (bdwellness.com/Support-Tools/Resource-By-Area/Study). Most campuses have an office that provides assistance for students with disabilities (such as mental health conditions) that can help you get academic accommodations. Academic accommodations could include assignment extensions, test-taking away from the classroom environment or learning assistance as needed. UBC has a mental health & wellbeing strategy: wellbeing.ubc.ca/mental-health-resilience … and a number of awesome student-led support groups incl. the-kaleidoscope.com & UBC Mental Health Network. Not to mention the important work CREST.BD does to advance BD research and Mood Disorders Centre, UBC, an outpatient Mood Disorders Centre. I wouldn’t say that there is currently a severe lack of research into BD. I would say that, as a field, BD research was quite ‘late out of the gate’ compared, say, to research into major depression, or schizophrenia. When we first established CREST.BD over a decade ago, one of the reasons we did so was because there was a general paucity of research exploring psychological and social issues in the condition. A lot has changed in a decade though, and you can no longer say that bipolar disorder is one of the ‘orphan conditions’ in psychiatric research. There are now many stellar organizations internationally focused on specifically advancing research into BD. In part, this is happening because of increasing awareness of the devastating toll the condition can have for the people who live with it, their communities, for workforces, and for society more broadly. More work also needs to be done to highlight the assets that people with BD bring to society. And, generally speaking, mental health research across all conditions remains woefully underfunded – this has to change. At CREST.BD, our mission is to optimize the health and quality of life of people w/ BD & empower communities to engage in BD research. We specialize in ‘Community Based Participatory Research’ (CBPR) which means that everything we do, we hand-in-hand with people who live with BD, family members, healthcare providers and other stakeholders. These values also shape the way that our research programs (in the target areas of stigma, quality of life, and psychosocial interventions) developed—each was nominated and then chosen as a priority through iterative community consultation and engagement activities. Part of this community consultation process involves our Community Advisory Group, a group with members representing people living with BD, BD healthcare providers, and partner organization representatives. This group provides feedback and guidance across CREST. We also build capacity for community engagement through strategic partnership building. To further enhance the reach of our community engagement, CREST.BD has established effective partnerships with approximately 17 diverse community and clinical organizations. We’ll be going through a similar consultation process when we develop our next strategic plan (our current plan runs to the end of 2019) – please sign up for our newsletter (crestbd.ca/news-and-events) and we’ll keep you informed! As with all chronic health conditions, self-care or ‘self-management’ strategies play a crucial role. At a basic level, self-management in bipolar disorder refers to the routine activities the person undertakes to maintain wellness and stability. While the person with bipolar disorder is in the driver’s seat when it comes to enacting self-management behaviors, it’s often most effective if their friends, family and healthcare providers are also passengers on the journey, like a support crew. Ideally though, they’re in the back seat, enhancing the driver’s autonomy, empowerment and independence. Research illustrates that most bipolar disorder self-management strategies are akin to the healthy lifestyle behaviors many of us aspire to, regardless of whether we live with a mental health condition or not: balanced diet, regular exercise, sound sleep, and so on. It’s not so much that the nature of the activities is different for people with bipolar disorder. Instead, it’s the cost of not doing them that differs. Take sleep as an example. Most people can manage with a few days disrupted sleep. People with bipolar disorder, however, can be exquisitely sensitive to disruptions in sleep routine – the cost of not prioritizing regular sleep can be high (for example, increased risk of an episode of mania). This represents a mundane reality for many people with bipolar disorder. Going to bed and waking at regular times, avoiding late night stimulation, planning carefully for time zone changes when travelling, monitoring diet, caffeine and alcohol intake so as not to disrupt sleep are often tiresome, but necessary, activities. There are a number of ways to effectively manage bipolar in between appointments with a clinician. There is no “one size fits all” method and requires the individual to use trial and error to come up with what works best for them. Sleep, diet, exercise, and a healthy environment all play into our wellbeing, especially those of us living with bipolar disorder. As someone who has worked in the hospitality industry for 13+ years I can’t count the numbers of times I’ve seen people struggling with their mental health and not receiving appropriate (or any) help, unlike lets say a physiological illness that is more well understood. Providing effective, evidence-informed support for people facing mental health challenges in the workforce is critical. In the ‘for employers’ section of our Bipolar Wellness Centre (bdwellness.com/employers), we summarize some of the steps employers can take. 1. Learning about mental health conditions. The more you understand, the better able you will be as an employer to facilitate a mentally healthy workplace. 2. Making connections in your community. Find out where to go if you or one of your colleagues needs help for a mental health condition. 3. Understand that employers are powerful agents of change in promoting mental health. Get started today with one organizational change and see what benefits follow for your organization, workplace culture, and community. Visit the ‘for employers’ section of the Bipolar Wellness Centre: bdwellness.com/employers. Thanks for the question! This was a topic Victoria Maxwell and I addressed in this webinar conducted in partnership with Partners for MH ‘Supporting a Colleague Facing a Mental Health Issue’ (youtu.be/RzgUEo4XDbA). If there’s one question I’ve been asked more than any other by people living with BD in my career, this is it. Yet, very little research has been conducted in this area. We’re aware of this small qualitative study performed by the The Spectrum Centre for Mental Health Research in the UK: Managing bipolar moods without medication: a qualitative investigation. – www.ncbi.nlm.nih.gov/pubmed/25527994 – what other work is out there? Like many diseases, bipolar can be very tough to treat. One thing I find helpful with treatment-resistant cases is getting a multidisciplinary mental health team involved, and a second opinion, to see if any options have been overlooked. It’s humbling to realize maybe I missed a step in the treatment algorithm, but it’s far more important that a sick person gets on good treatment. So, you check your ego at the door and get a team involved. Great question. There are some resources that might be useful here: bdwellness.com/Support-Tools/Resource-By-Area/Relationships … – see the one from NAMI – but lets open this Q out to the wider CREST.BD community – what disclosure techniques work well for you? Medications have definitely been life saving for me however as a single mother living on a disability pension I have struggled to keep a stable medication regime which has lead to several suicide attempts and hospitalizations. I’d recommend starting by having a look at the diverse resources offered through this directory which was curated by unsuicide.org, which includes metanoia.org/suicide. Finding someone to talk to through groups such as 7 Cups (7cups.com) might also be helpful.